Sounds like a bit of magical realism might be in play here with the whole cloud thing. 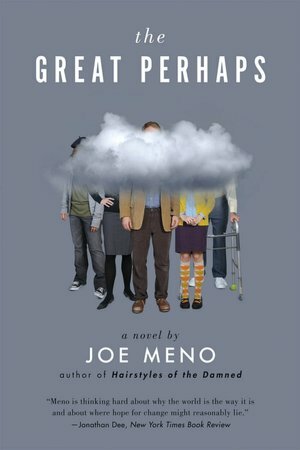 Have you read any other of Meno's novels? I haven't - but I've read a few of his short stories, though it was awhile ago. Have you? Not yet. Would like to read this one for sure. Yeah, just on the surface, it sounds like it should be hilarious. It's out there, for sure - but it's rarely (if it all) funny. Still, it's very good! I'm glad you clarified that this is not, in fact, a funny book - the premise certainly sounds like it could be. Not that that's a bad thing, just interesting. I'd actually never heard of Meno before your review, but I'm intrigued. Plus I want to find out what a "sparkly cloud" is. By the way, looking forward to seeing your thoughts on State of Wonder. It certainly has all the elements of slapstack, but they never come together as such. I think that's one of the reasons I liked it so much - slapstick would've been the easy way out. But Meno made this believable (even with the magical realism - or whatever that sparkly cloud plotline counts as). Meno's kind of an under-the-radar writer, I think - but he's well known in Chicago. He teaches at a small college here. SOW = so far, so awesome!